VideoStudio just got more creative â and so can you. 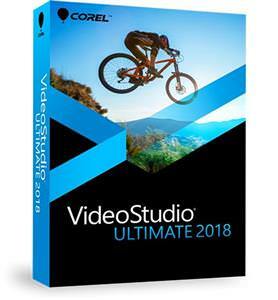 New VideoStudio Ultimate 2018 brings the intuitive editing experience you love and turns up the creativity with exciting new features like the Split Screen Video, 3D Title Editor, new premium video effects and more! Weâve enhanced the tools you use most often! Easily crop, resize, and position your media directly in the preview pane. Snap your media in place with new Smart Guide alignment tools. The entire toolkit is faster and easier to access. Tap into hundreds of pro-quality presets and creative effects that deliver results beyond what you thought possible, and give you more time to focus on what matters – your story. Now includes NewBlue Titler Pro 5! Simply import your 360Â° footage and start editing! With expanded support for popular 360 degree cameras, export your 360 video directly to YouTube, your VR headset, and more!